Luke chapter 2 is about the birth of Jesus. The shepherds, who are out in their field at night, were visited by the angel of the Lord, and “the glory of the Lord shone around them and they were filled with fear.” Any time that term is used, it is accompanied by great light, which would have doubtless brightened the field substantially. This would certainly have generated fear among them. Telling them not to be afraid, the angel told them of the good news of the birth in the city of David of “a Savior, who is Christ the Lord.” The angel also told them how they would know him when they went to see him. We do not know what constituted the “multitude of the heavenly host” that also appeared in verses 13-14, but it would seem to at least be a multitude of angels. What else (cherubim, perhaps?) we do not know. Verses 1-21 of chapter 3 are all about John the baptist “preparing the way,” as had been foretold in Isaiah 40:3-5 and elsewhere. He was baptizing people for repentance and the forgiveness of sins. It was a completely new concept for the people that he was preaching to, especially for Jews. He reluctantly baptizes Jesus then. In verses 19-20, Luke writes about Herod’s arrest and imprisonment of John the baptist. Verses 23-38 of chapter three list the genealogy of Jesus Christ. But this genealogy is different from the one listed in Matthew. This writer believes, as some scholars do, that this genealogy is of the line of Jesus’ mother, Mary. For my analysis of this argument, please see this previous post. Verse 8 of Luke chapter 2 picks up with the shepherds who are out in their field at night. Depending on the version you read, they were in the same region as Mary and Joseph or in the same country. The translation has the same effect in either case – so that we are not sure exactly how far away they are, but certainly not in a separate country. When the angel of the Lord appeared to them, “the glory of the Lord shone around them and they were filled with fear.” Any time that term is used, it is accompanied by great light – whatever else it means. In this case, certainly not as bright as what Paul (Saul) encountered on the road to Damascus (Acts 9), but in a dark field in a time when there were no distant city lights, it would be quite substantial and unnerving. 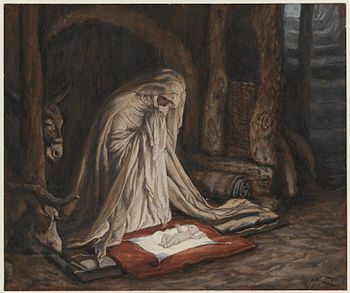 Calming them, the angel told them of the good news of the birth in the city of David of “a Savior, who is Christ the Lord,” and old them how they would know him when they went to see. The sudden appearance with the angel of “a multitude of the heavenly host” raises the question of what makes up a heavenly host. Generally, a “host” is a military term, where the collective group is associated with fighting a battle or guarding something. In the case of the Lord, they are associated as being at His side, praising Him, and ready to do his bidding (Psalm 103:21, Daniel 7:10). And verse 15 gives us the answer. After they finished praising the Lord Jesus, the verse tells us that the “angels” went away into heaven. Since only one angel had appeared before the heavenly host came, that tells us what sort of multitude they were.